Garage Envy offers unique garage storage ideas & solution to fit your garage equipments & premises. 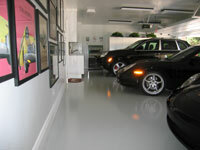 For the exotic and luxury car collector, only a dream garage offers the proper showroom for your little babies! 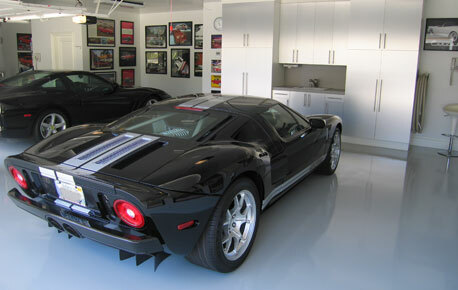 This garage is a showroom and a shrine, as functional as it is beautiful. 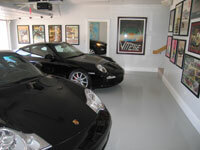 Detailing these automotive works of art is easy with wall-hung vacuums and ceiling-mounted air hoses neatly concealed but only an arm’s length away. The stainless steel cabinets add drama and shine to the space, while housing everyday necessities including car cleaners and polish, towels and chamois, buckets and gloves. The polished concrete floor proudly reflects the silhouette of each mechanical showpiece. 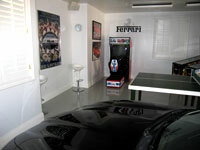 There’s room for fun in this garage, too, with a ping-pong table, pinball machines, video games and antique jukeboxes wired for surround sound.